The following was in an email from Abby King from the Bicycle Coalition of Maine. Here is a way to make Sanford and Springvale a safer place for our kids to bike and walk. The Sanford Active Community Environment (ACE) Team is a local group thatÂ envisions a community where residents and visitors can walk or bike across town safely and comfortably. Their mission is toÂ foster a community environment in Sanford that is safe and inviting for people of all ages to enjoy active lifestyles. ACE Team meetings are open for any local resident or organization that wants to be involved in advocating and promoting bicycle- and pedestrian-friendly policies, programs, and infrastructure.Â Join the next meeting! The Sanford Junior High School Bike Club will have an informational session next Wednesday, April 16th after school. Bike inspections and a bike rodeo are featured April 30th, the Wednesday after spring vacation. Its time to ride! 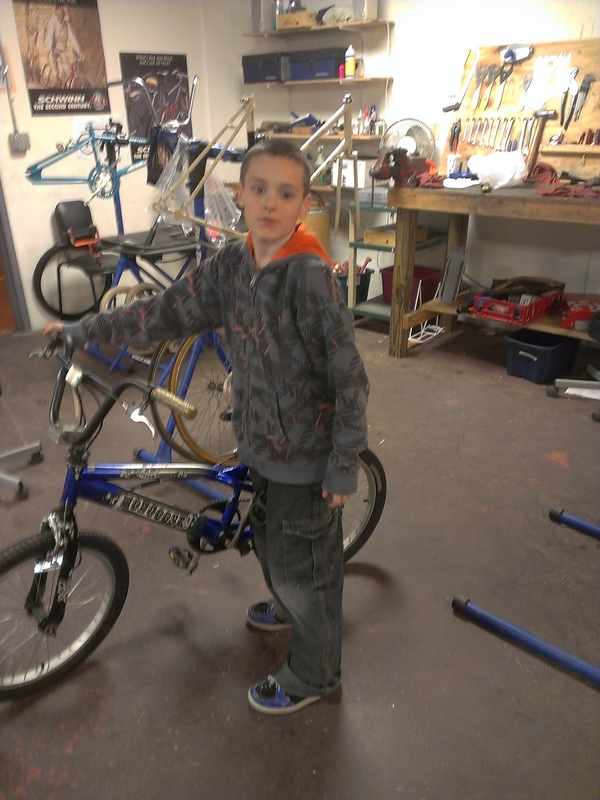 Dan finished rebuilding this BMX bike just a few days after his brother. Dad was a big help with both jobs. Congratulations Dan!